The introduction in the 1970's of wide bodied Airliners such as the 747 Jumbo saw the VC10 becoming uneconomical to operate which led to its withdrawal from passenger service. The final Commercial flight of a VC10 was on the 30th March 1981, by British Airways (the successor to BOAC) this ended the civil side of the story, but it certainly didn't end the story of the VC10 as its military Career with the Royal Air force was only just beginning. having no need to replace the fuselage’s fuel tanks. Overall, the conversion to the K4 variant was undertaken on five former passenger airliners. Since the late 1990s, this type of aircraft took part in a variety of different scale conflicts in many parts of the world, including air strikes against Serbia, in the Second Iraq War (Operation Telic), and in air strikes against the Gaddafi regime in Libya. 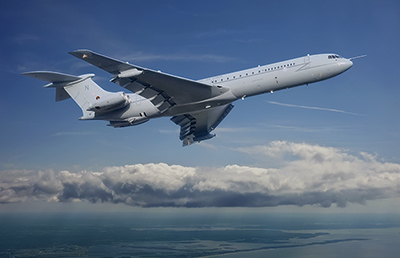 In 2013 the Royal Air Force made the decision to remove the VC10 from active service, having adopted the program of their replacement by the new A330MRRT tanker. Now the K4 tankers which were already considered obsolete have been completely retired from service, and sent for dismantling.